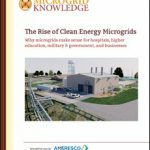 Microgrids have received heightened attention in recent years from government, industry and the media. So it’s easy to get the impression that they are a new technology. In truth, simple microgrids have been around since the time of Thomas Edison. More importantly, several colleges and universities have been operating microgrids for decades. These institutions demonstrate that microgrids can function compatibly with the local utility grid, and indeed benefit not only energy customers within the microgrid, but also those served by the larger grid. SuperStorm Sandy, with its crushing destruction of the Northeast’s electric system, raised awareness about the value of microgrids. 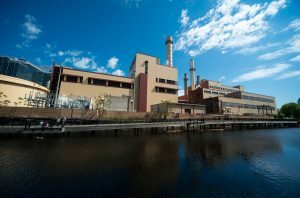 In fact, the Princeton University microgrid was widely recognized for its continuous operation during Sandy while over 8.1 million electricity customers were without power from New York to Michigan. But microgrids actually began gaining traction several years earlier as governments and energy experts identified needs they fill within a modern grid. In Europe, microgrids are part of a broader smart city trend. Smart cities use advanced technology and communications to create urban environments that are more livable, efficient and eco-friendly. In the U.S., today’s keen interest in microgrids can be traced directly to grid modernization legislation passed by Congress eight years ago. The Energy Independence and Security Act of 2007 acknowledged that the U.S. grid was aging and would benefit from replacement and updating. The law brought about a collaboration of federal agencies and research institutions, which fostered policy for smart grids and microgrids. The Department of Energy subsequently identified advanced microgrids as being an essential part of the modern electrical grid. Since then, the DOE has made development of next generation microgrids a high priority. Now, industry analysts are forecasting significant microgrid growth in the coming years. Navigant Research predicts the worldwide market for what it calls ‘community resiliency microgrids’ will expand from $162.9 million in 2015 to $1.4 billion by 2024. For the broader microgrid market, revenue may reach $40 billion by 2020, with much of the activity centered in the U.S. That would mean five-fold growth in microgrid installations, from 866 MW in 2014 to 4,100 MW by 2020, according to Navigant. So what are these new, advanced microgrids exactly? A form of distributed energy, microgrids often are described as mini-versions of the larger electric grid because they can mimic, on a much smaller scale, the grid’s primary function: energy production by more than one source and its coordinated distribution through wires and pipes to one or more customers. There is no one type of microgrid. This not a plug-and-play technology; it is customized to solve a particular community energy or grid problem. An advanced microgrid will always include at least one form of power production. The power often is produced by natural gas, diesel, renewable energy or fuel cells. To achieve high efficiencies, many microgrids incorporate combined heat and power (CHP), and might include related district energy. Also called cogeneration, CHP is often extolled for its two-for-one advantage. CHP derives twice as much energy from the same amount of fuel as does a conventional power plant. So if you spend one dollar on fuel to operate a conventional power plant, you derive a certain amount of electricity. If you spend the same dollar to operate a CHP plant, you derive the same amount of electricity, plus heat energy that you can use to heat or cool buildings, manufacture products, or use in some other heat-intensive process. CHP makes use of the heat created in the process of generating power. Conventional power plants, in contrast, simply discard the heat. District energy, often coupled with CHP, also is a part of some microgrids. A district energy system supplies steam or hot water for space heating and chilled water for air conditioning through an underground piping network, enabling connected customer buildings to avoid installation of boilers, chillers and cooling towers. The thermal grid creates an economy of scale that facilitates deployment of CHP and other highly efficient or renewable technologies. Very often, thermal energy storage provides additional benefits in optimizing production during off-peak hours and displacing peak demand during more expensive daytime periods. The advanced microgrid is most distinguished by its increasingly sophisticated software and controllers. Several master microgrid controllers are in development or have been released in recent months. Some of them are offered by energy industry giants who are vying to capture the growing microgrid controller market. An advanced controller manages the microgrid’s resources. It can choose to serve customers with various configurations of the microgrid’s onsite power or rely on grid power, depending on what offers the greatest price and operational value. The microgrid looks at electricity prices minutes or days ahead and also considers weather and other variables in its decision-making. The most advanced controllers manage the microgrid autonomously—without human intervention. Microgrids advanced controllers, software, switches and sensors make them advanced energy managers. Microgrids also may include other resources. For example, many now use energy storage, particularly batteries. Batteries are falling in price and can gain additional cost advantage for the microgrid in certain wholesale energy markets. Similarly, electric vehicle charging stations are sometimes incorporated into a microgrid. Demand for EV charging stations remains small today. But it is expected to grow. EVs, which operate with batteries, may eventually act as widespread energy storage devices for microgrids and the larger grid. Last, customers are an important part of any microgrid. The customer, or ‘load’, may include buildings, homes, data centers, research facilities, manufacturers or other energy users. The load is a resource that is managed on the microgrid, as is generation. Consumption is configured for maximum efficiency. For example, the microgrid’s customers may take their power from the grid during periods when demand is minimal and grid prices are low. But when the grid becomes strained or prices rise, the microgrid may serve its customers with its own on-site power plants. The local utility also is a customer of the microgrid, in the sense that microgrid can provide it with power supply and other energy services. Conversely, the microgrid is a customer of the utility, since it takes power supply from the utility when it makes economic sense to do so. So the relationship between utilities and microgrids can be mutually beneficial, even symbiotic at times. 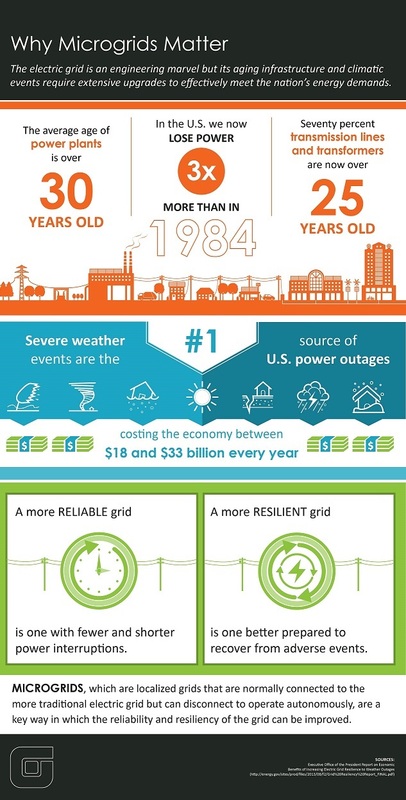 Advanced microgrids have several abilities that make them valuable to customers and the grid. The microgrid can run in parallel to the grid or can partition from the grid (“island”), as circumstances dictate. In island mode, the microgrid stops taking service from the grid and acts as a standalone source of power supply for its customers. This can be particularly valuable to mission-critical facilities housing surgical centers or research, since it reduces the urgency for grid service resumption. Advanced microgrids also have black-start capabilities, which allow generators to start up cold. Ideally, the generator supplies power without the customer experiencing any interruption. This function, when fully in place, makes it so that customers are unaware that the microgrid shifted between grid power and self-supply. IEEE has created standards and best practices for safe microgrid islanding, black-start operations, and grid-reconnection, known as IEEE 1547.4. A Guide for Mayors and City Leaders Seeking Clean, Reliable and Locally Controlled Energy,” available for free download courtesy of the International District Energy Association and OBG. This is the second article in our series on community microgrids. 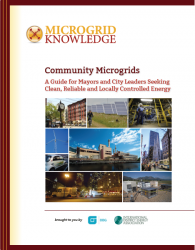 See our first article: What Community Microgrids Offer to North American Cities and Towns.